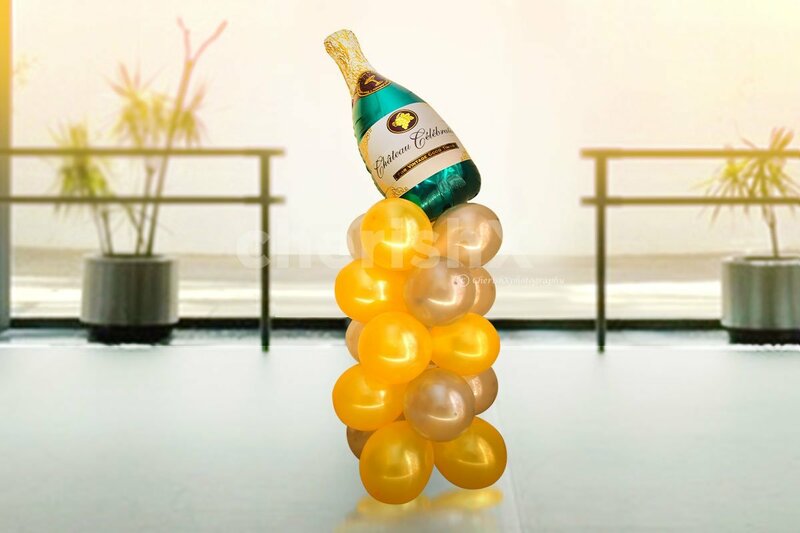 Spell luxury, elegance, and joy with this premium GOLD-themed balloon decor! Special occasions call for special decorations. 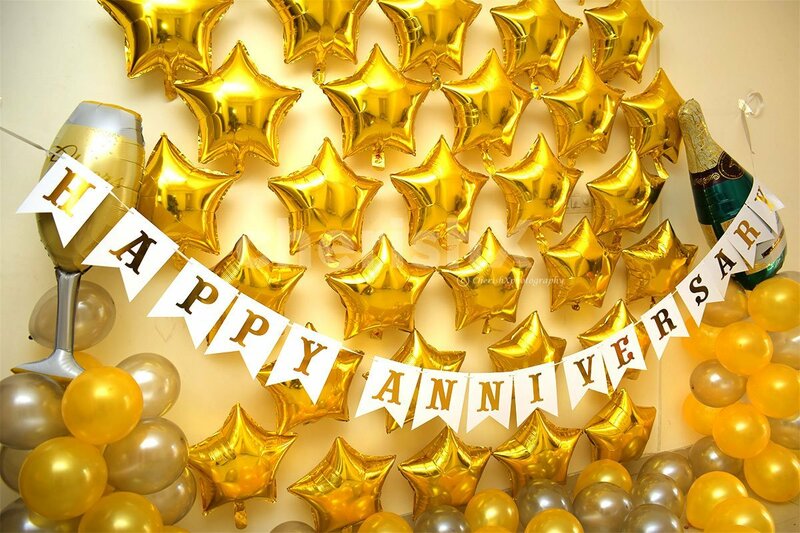 One such occasion that is close to your partner's heart is your anniversary. So dont think twice, sweep them off their feet and make them fall in love with you all over again on this meaningful day. We bring to you for this occasion a decoration that will leave you overwhelmed- a premium gold-themed decor like no other! 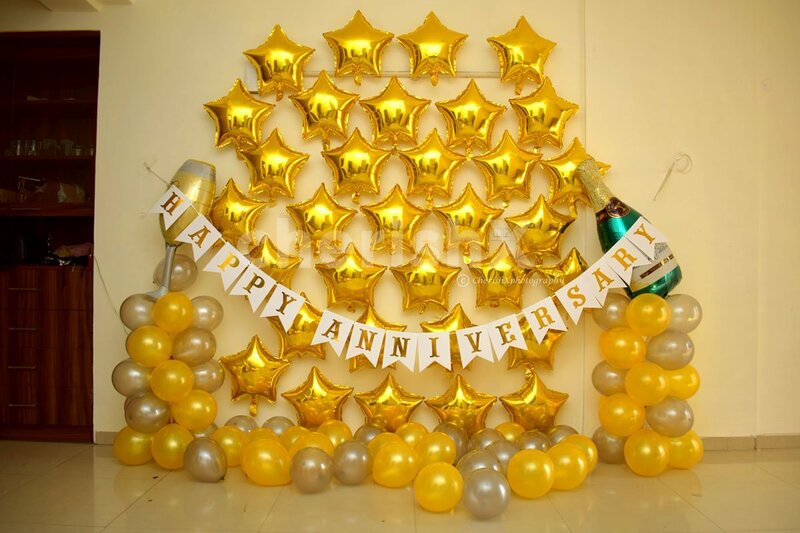 Done up using excellent quality and elegant-looking balloons, this decor consists of 32 golden coloured star-shaped foil balloons that will be stuck on the wall using soft removable tape, a balloon stand made of 10 metallic grey and 10 golden balloons with a foil balloon on top which is in the shape of a champagne glass with 'cheers' written on it, another balloon stand with 10 metallic grey and 10 golden balloons with a champagne bottle foil balloon on top, 15 metallic grey and 15 golden balloons strewn aesthetically on the floor, along with a silver 'happy anniversary' bunting spread across the wall. The decoration will be done at your home or at a location of your choice by our team. One thing is for sure- when your loved one walks into the room and sees this amazing decor, he/she will be bowled over. The GOLD theme of this decoration exudes luxury, elegance, and class. Moreover, the quality of balloons used in this decor is absolutely flawless, and will look brilliant once the entire set up is complete. We always say, that when you are giving someone a surprise,-the bigger you go, the better it gets! So we have crafted some thoughtful customisations just for you! Sweeten the occasion with a delicious birthday cake. Add some more zing to this decor with a decoration of flower petals and candles. Add adorable 'Mr' and 'Mrs' balloons, or say it with numbers by adding our gorgeous number pillars. There's much, much, more for you to choose from! Just checkout our Delightful customisations from below! 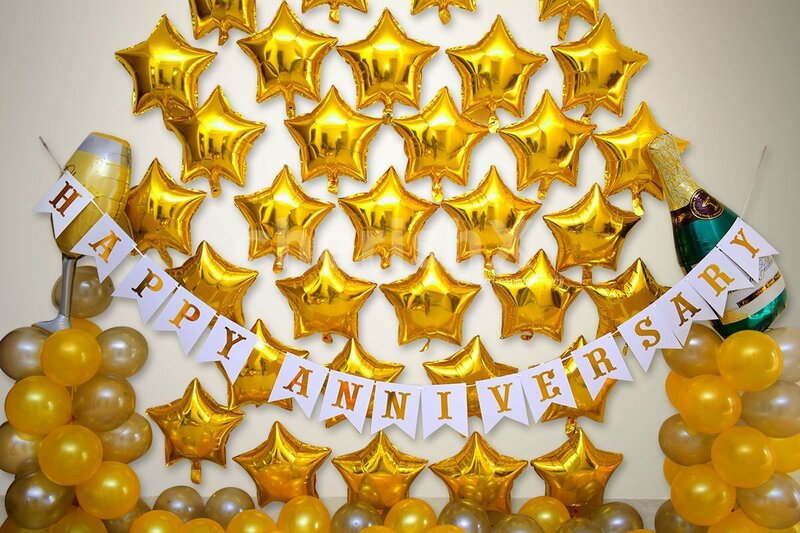 32 Golden star-shaped foil balloons stuck on the wall with soft, removable tape. 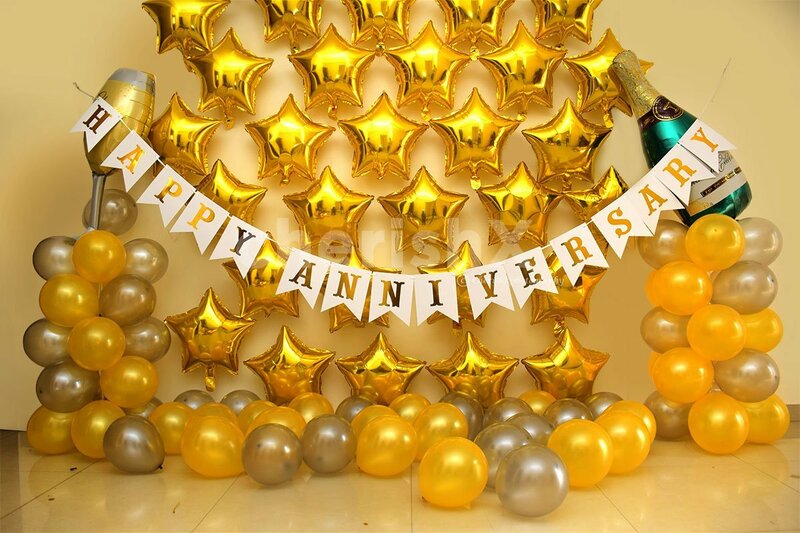 A balloon stand made with 10 metallic grey balloons and 10 golden balloons with a foil balloon on top with 'cheers' written on it. 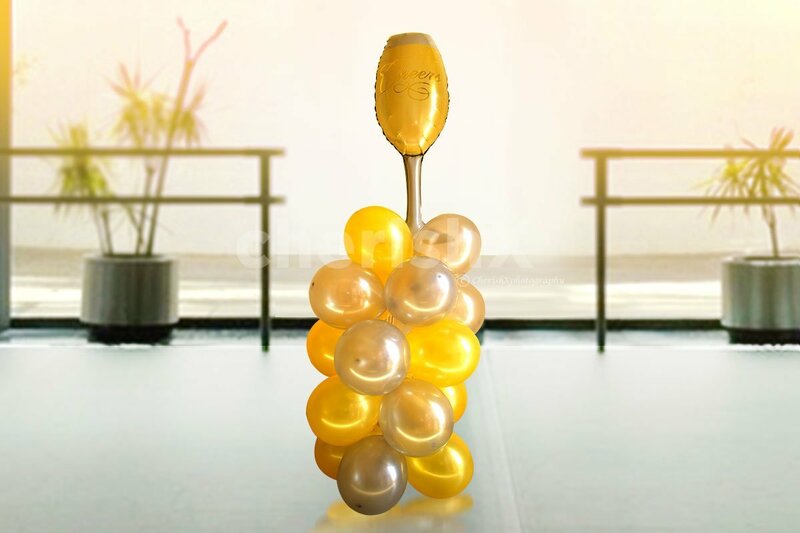 A balloon stand made with 10 metallic grey balloons and 10 golden balloons with a foil balloon on top in the shape of a champagne bottle. 15 metallic grey and 15 golden balloons strewn aesthetically on the floor. This decor can be converted to Silver Theme Decor. The choice to do so will be taken after the booking. This decor can be be converted to a Birthday Decor by replacing the Anniversary Bunting by Happy Birthday Bunting. The choice to do so will be taken after booking. If numbers are important to you, why not flaunt them beautifully in your decor!